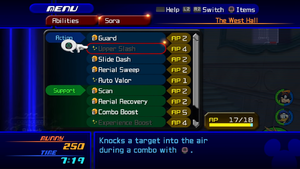 In Kingdom Hearts II, the Abilities list is divided into Action, Growth, Support, and Weapon abilities. The Ability system in Kingdom Hearts II has received both minor aesthetic upgrades, as well as major mechanical changes. An Ability can now be equipped or unequipped simply by pressing while highlighting its entry in the Ability menu, and are now separated into Action, Growth, and Support sets, which are distinguished by the color of their entry (blue for Action, yellow for Growth and green for Support abilities). Action abilities (アクションアビリティ, Akushon Abiriti?) are those which are used directly in combat, and are often tied to button-presses, while Support abilities (サポートアビリティ, Sapōto Abiriti?) are those which enhance the character's stats, and are often passive. Kingdom Hearts II also expands Abilities such as Dodge Roll and Glide into Growth abilities (グロウアビリティ, Gurou Abiriti?, lit. "Grow Ability"), which affect Sora's movements, and can be upgraded by leveling up his Drive Forms. Kingdom Hearts II also introduces Weapon abilities (ウェポンアビリティ, Wepon Abiriti? ), which are support abilities that are attached to a particular weapon. These abilities require no AP to equip, as they remain active for as long as the item remains equipped. Each of Sora's Keyblades possesses a Support Ability, as well as Donald and Goofy's strongest weapons. All active Weapon abilities are listed at the very bottom of the Abilities menu. Some of the rarer Armors and Accessories also provide the effect of a support ability; however, they are not formally named and listed in the Abilities menu. While Sora can still learn most of his Support and Growth abilities through leveling up, all of his standard Action abilities are learned after completing certain events. Like his stats, Sora will also inherit any abilities that Roxas possesses when the two reunite. However, allies no longer gain abilities by leveling, and instead gain them solely from events. Finally, each of Sora's Forms possesses its own Ability set, which temporarily replaces his normal set of Action and Growth abilities; while the Forms also possess unique Support abilities, these add to rather than replace those that are equipped to Standard Form. Like Weapon abilities, the Abilities belonging to each Form require no AP, but they cannot be replaced or unequipped. These Ability sets also include the Growth ability linked to that Form, on a stronger level than Sora can use in Standard Form. The AI used to determine when allies use their Abilities has also been made more controllable. Each Action ability can now be switched between frequent, moderate, rare, and no use. ↑ 2.0 2.1 Defeat the Possessor and Thresholder. ↑ In Lion Form, this is translated as "Retaliating Smash". ↑ Defeat the Dark Thorn. ↑ 10.0 10.1 Clear the trap at the Village Cave. ↑ Complete the Battle of the 1000 Heartless. ↑ 14.0 14.1 Defeat Shan-Yu. ↑ 17.0 17.1 17.2 Defeat Captain Barbossa. ↑ Get Queen Minnie safely to the throne. ↑ 26.0 26.1 Defeat Pete at Olympus Coliseum. ↑ Clear the trap at The Cave of Wonders: Stone Guardians. ↑ 30.0 30.1 Free the Cornerstone of Light. ↑ Defeat the Grim Reaper at the Harbor. ↑ Defeat Pete at the Wharf. ↑ Defeat the Storm Rider. ↑ 34.0 34.1 34.2 34.3 34.4 Mulan loses her disguise. ↑ 35.0 35.1 35.2 35.3 Access the DTD. ↑ Defeat the Dusks at the Station of Serenity. ↑ 58.00 58.01 58.02 58.03 58.04 58.05 58.06 58.07 58.08 58.09 58.10 58.11 58.12 58.13 58.14 58.15 58.16 58.17 58.18 Choose the Dream Sword at the Dive to the Heart. ↑ 59.00 59.01 59.02 59.03 59.04 59.05 59.06 59.07 59.08 59.09 59.10 59.11 59.12 59.13 59.14 59.15 59.16 59.17 59.18 Choose the Dream Shield at the Dive to the Heart. ↑ 60.00 60.01 60.02 60.03 60.04 60.05 60.06 60.07 60.08 60.09 60.10 60.11 60.12 60.13 60.14 60.15 60.16 60.17 60.18 Choose the Dream Rod at the Dive to the Heart. ↑ 61.0 61.1 61.2 61.3 61.4 61.5 61.6 Learned at the beginning of the Third Day in Critical Mode. ↑ Defeat the Grim Reaper at The Black Pearl. ↑ Defeat the Hostile Program. ↑ Defeat the Nobodies at The Old Mansion. ↑ Defeat Shenzi, Banzai, and Ed at The King's Den. ↑ Defeat Demyx at Hollow Bastion. ↑ Freeze the computers at the Dataspace. ↑ 82.0 82.1 Download the MCP-killer program. ↑ Defeat Demyx at Olympus Coliseum. ↑ Defeat Shenzi, Banzai, and Ed at the Elephant Graveyard. ↑ Defend the Solar Sailer Simulation. ↑ Defeat Zexion's Absent Silhouette. ↑ Clear the explosives from the Interceptor. ↑ Defeat Lock, Shock, and Barrel. ↑ Defeat the Prison Keeper. ↑ Defeat the Heartless at The Cave of Wonders: Treasure Room. This page was last edited on 14 January 2019, at 18:40.